More than 4,000 people are expected to participate in the second annual Mercy in Action (MIA) Day of Service Day on October 14, 2017. Organized through Catholic Charities of Southeast Michigan (CCSEM) in cooperation with Catholic parishes in the Archdiocese of Detroit, the event will involve more than 200 service projects to help those in need and improve local communities throughout metro-Detroit in Oakland, Macomb and Wayne counties. 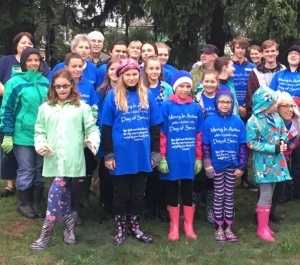 Service projects include a walk-a-thon to raise money for several charities, cleaning up historic cemeteries, supporting first responders and members of the military, blood drives, food pantry collections, volunteering at soup kitchens, clothing drives, serving the homeless, visiting nursing homes and much more. Almost every one of the 68 Catholic churches participating is accepting in-kind donations to benefit charitable organizations. For more information on these activities, contact Kelly Luttinen at 248-548-4044 ext. 3621 or luttinenk@ccsem.org. To volunteer, contact Joyce Hyttinen at 248-416-2300 ext. 4032 or hyttinenj@ccsem.org.